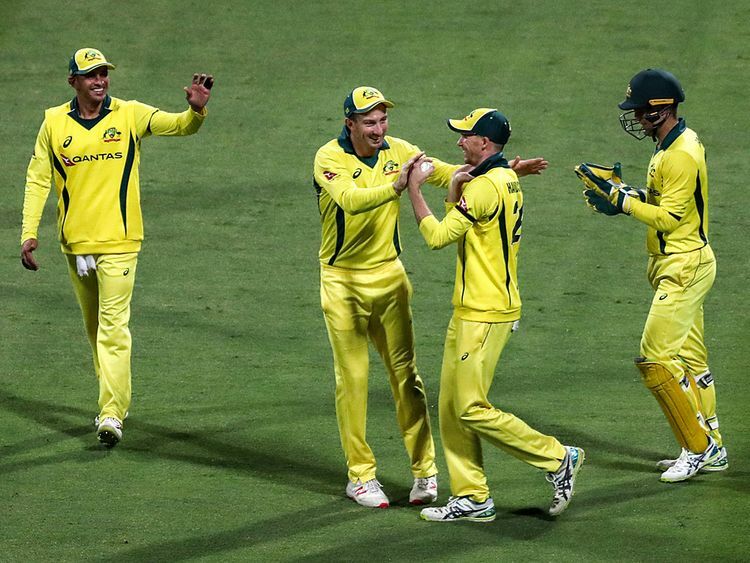 Abu Dhabi: Skipper Aaron Finch fell shy of becoming the first Australian to score three centuries in a row but Pat Commins made a telling return with 3 for 24 and Adam Zamba with 4 for 43 saw the men from Down Under take an unassailable 3-0 lead in the five-match ODI series. Facing a must win situation, Pakistan, chase a daunting total of 267, were bowled out for 186 in 44.4 overs to lose by 80 runs in the third ODI at the Shaikh Zayed Cricket Stadium on Wednesday. As the gloomy day ended and floodlights took centre stage, Pakistan’s run chase came under the clouds straightaway. Cummins, coming in place of the injured Jhye Richardson, packed off opener Shan Masood cheaply. Cummins then induced an edge off Harish Sohail in his next over and Pakistan were reeling at 16 for 2. A passing shower then allowed the hosts an eight-minute break to reassess the situation but as soon as the covers were off, another wicket fell. Cummins was the tormentor again, on the last ball of that pending over. It was the big wicket of the centurion from the last outing, Mohammad Rizwan, who made his walk back following a review after edging one for a duck. Interim skipper Shoaib Malik and opener Imam Ul Haq then tried to build a partnership. Imam, who failed in the first two matches with scores of 17 and 0, scored a watchful 46 off 72 balls but once he fell leg before to Glen Maxwell, Pakistan’s slide started. With Malik getting out to Nathan Lyon while on 31 off 50 balls, Pakistan were reduced to 96 for 5. Umar Akmal (36) and Imad Wasim (43) put on a partnership of 59 for the sixth wicket but once that was broken, the writing was on the wall. Earlier, skipper Finch, who scored 116 and his career-best unbeaten 153 in the first two matches, was in line for the third one but fell short by a mere 10 runs. Maxwell with 71 off 55 balls and Alex Carey (25 not out off 21 balls) provided much-need impetus to the Australian innings towards the end, as they managed 90 in the last 10 overs to reach 266 for 6. On a greenish pitch with overcast conditions, the Pakistan pacers, unlike the previous outings, proved effective. Usman Shinwari, playing his first match of the tour, was on the money straight away. Usman Khawaja, who has scored six 50 plus scores in his last 10 innings, fell for a duck to Shinwari’s incoming delivery that rattled the off stumps. Australia were in further trouble with Junaid Khan, also playing his first game of the series, getting Shaun Marsh caught in front of square by Shan Masood. However, Peter Handscomb and Finch then resurrected the innings with some high quality batting. Handscomb was in line for a solid fifty but left-arm spinner Sohail beat him in the flight and was bowled for 47 off 43 balls. Spinning all-rounder Imad Wasim immediately made his presence felt with the wicket of Marcus Stoinis. Australia, who were reduced to 140 for 4 in 31 overs, only managed to add another 36 more to the total by the 40th over. But Maxwell and Carey later proved very effective with the bat to ensure their side had a testing score onboard. Australia 266 for 6 in 50 overs (Aaron Finch 90 off 136 balls, Peter Handscomb 47 off 43 balls, Glen Maxwell 71 off 55 balls, Alex Carey 25 off 21). Pakistan 186 all out in 44.4 overs (Imam Ul Haq 46 off 72 balls, Shoaib Malik 32 off 50, Umar Akmal 36 off 46, Imad Wasim 43 off 53, Pat Commins 3 for 24, Adam Zampa 4 for 43). Australia win by 80 runs.